Totopo transmits from the Barrio of the Fishermen, or the Seventh, one of the most characteristic and oldest areas of the city of Juchitán that is marked by a sense of unique cultural identity and rootedness generated amongst working people, potters, fishermen, homemakers and merchants. It is to this public that Radio Totopo directs its content, accompanying peoples’ daily lives in their homes, workshops, markets and festivities. The broadcasters know that their presence in this barrio and their existence as a community radio depends on the links they cultivate with their community. This is how Radio Totopo has operated for more than a decade, and this past year was no exception. In 2017, an 8.2 degree earthquake on September 7 as well as a 6.1 degree earthquake on September 23 brought incalculable damages to this part of Mexico. A considerable percentage of homes collapsed, along with important buildings such as the market, hospital, and city hall. Other buildings with structural damages are still slated for demolition. In this context of emergency the radio has played an essential role in the response and reconstruction of their city. Totopo has functioned as a collection and distribution center for the foodstuffs, tools and materials sent by diverse organizations and people. Totopo has also provided critical infrastructure and know-how for the organization and communication of local residents. Children who have not been able to attend classes because their schools were damaged during the earthquake have found in the radio’s patio a place to participate in recreational activities such as painting and reading. At the same time, the community kitchen continues to operate from the radio station, ensuring adequate nourishment for the children and compañerxs who arrive to help out. Finally, people who lost their homes and continue to experience post-traumatic stress from the earthquakes and its many after-schocks have found in the radio a place to converse and console one another, accompanied by the brigades of psychological support organized by Mexican universities. Following the earthquake Radio Totopo has also coordinated with communities beyond Juchitán, such as Comitancillo and Espinal, to deliver provisions, cots, and hammocks. When heavy rains arrived, they also helped to install tarps and metal structures for temporary shelters. One of Totopo’s most recent activities involved the fabrication of 300 traditional blouses and skirts to be delivered to the older women of the community. While it is true that clothing has been sent to collection centers, the Zapotec women maintain a strong connection with their culture, and their traditional forms of dress are an important part of their identity. These activities would not have been possible without the cooperation of many people who have supported with funds, materials and foodstuffs. The radio has played the fundamental role of catalyst and coordinator of this solidarity and mutual aid. 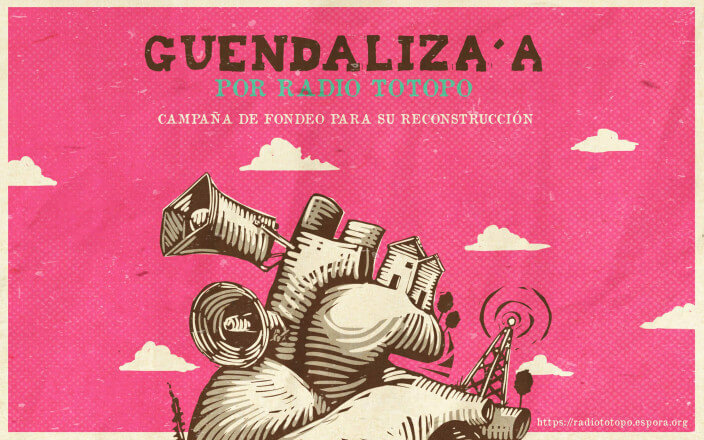 Radio Totopo’s primary goal is to strengthen the social fabric of their community, consolidating collective forms of reconstruction and rearticulation between the peoples of the region. This in the face of the neglect of the Mexican government and Natural Disasters Fund, which has prioritized the signing of lucrative contracts with private builders. During these ongoing difficult times, the radio has not been able to resume its normal transmissions. The rented house where the radio station operated has suffered damages and is not in conditions to be used in the long term. The emergency is not over, and the work carried out by Radio Totopo is fundamental not just in these moments but for years to come. The radio’s fundamental role in the defense of this territory from the imposition of wind turbine projects attests to this. To continue these labors, Totopo must acquire its own plot of land where it will be possible to reinstall the radio station and continue to host meetings in a secure manner. It is with the goal of acquiring this land that the radio and its allies are calling upon all collectives and individuals to join this collective fundraising effort. Through solidarity nearly half of the required amount has been raised, and we are counting on our extended community to help us collect the remainder so that Totopo can continue to maintain this vital communal space. So happy to see this support for Radio Totopo. I have worked with these folks, and they are doing fantastic work in their community, the Septima Seccion in Juchitan, one of the poorest and most neglected neighborhoods in the city that is predominantly indigenous. The station is a real hub of community organizing in the region, for example in the struggle against the destructive megaprojects of the Isthmus of Tehuantepec. (see, eg, this video on the fight against the windfarms, so called green energy projects that are devastating the area. One of the interviews was filmed at the Radio Station.